In this paper we propose an algorithm for exhaustive search of GIS Mobile query (point- in-area function). 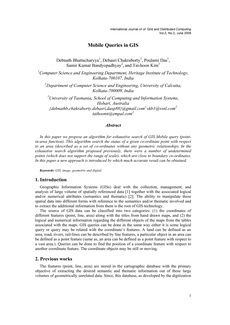 This algorithm search the status of a given co-ordinate point with respect to an area (described as a set of co-ordinates without any geometric relationship). In the exhaustive search algorithm proposed previously, there were a number of undetermined points (which does not support the range of scale), which are close to boundary co-ordinates. In this paper a new approach is introduced by which much accurate result can be obtained.